Welcome to Villa Allegria, an authentic reflection of the pristine Italian Riviera, where no detail has been overlooked and stunning ocean views are enjoyed at this private hillside estate. From a rustic curved-tile roof imported from Italy and France, to hand-blown glass fixtures by Alison Berger and incredibly smooth Venetian plaster, every detail was thoughtfully considered to create a realistic yet tastefully understated villa of an awe-inspiring caliber. The vision was created by renowned architect Bob White and living areas were stunningly appointed by Michael Smith Interiors, which recently re-designed the interior of the White House. Entering from Diamond Street, this residence is truly the jewel of the neighborhood, lushly landscaped with mature olive and cypress trees that effortlessly invite you down the steps to the dramatic glass-and-iron framed door. An extraordinary great room takes your breath away with ocean views; dramatic high ceilings featuring grand oversized beams built with timber reclaimed from an old Canadian Mill; Richard Marshall quarter-sawn oak flooring; European stone-clad columns that frame the room; a custom main chandelier; and impressive 18th Century French stone fireplace–1 of 6 imported fireplaces throughout the home. Retaining the home’s authentic and historic style, a chef-caliber kitchen presents top-of-the-line modern appliances and custom-crafted cabinetry. An elegantly appointed dining area is surrounded by picture-perfect ocean views and custom windows that create a romantic indoor setting warmed by glowing evening sunsets that subtly radiate joy and serenity. At the end of a distinctive hallway, a cozy and romantic master suite showcases a magnificent closet with African burl wood cabinetry. An equally impressive and spacious master bath reveals a copper and Zink soaking tub by Herbeau, set in an ideal orientation for ultimate privacy and relaxation while overlooking the ocean. 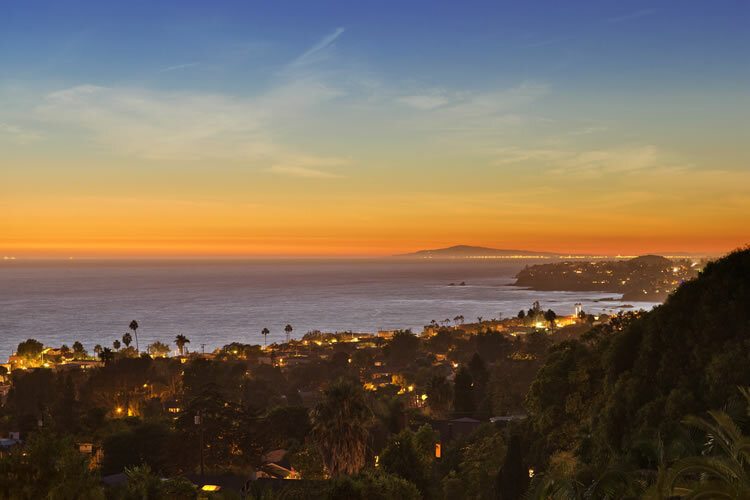 Above the master sits the luxurious ocean-view office, which rewards the consummate working professional with a private retreat that is refined by custom built-in shelving and cabinetry. Opposite the master suite awaits an authentically rustic wine cellar, with humidity and temperature controls and capacity for approximately 850 bottles of the finest domestic and imported vintages. A gorgeous private guest suite opens to its own secluded balcony and enjoys beautiful coastline and picturesque garden views. Next, warmth and history are incorporated with ease in a formal library that is beautifully appointed with built-in alder wood bookcases. A handsomely crafted state-of-the-art media room can accommodate a flat screen up to 60″ in size. Serene and lush grounds are enhanced by a private guest suite/maid quarters separated from the main villa, offering an ideal spot for relaxation. A large saline pool with effervescent ocean-inspired blue water is accompanied by a covered cabana with curtains and an antique fireplace, creating an outstanding environment for entertaining. Below the pool, an intimate dining area with wood-burning fireplace is gently tucked into a garden, where the enchanting sounds of fountains and birds accentuate outdoor meals. Fruit-bearing trees lend splashes of color to the gently terraced garden, which exhibits red and white roses that are carefully placed to provide a sprinkle of color in all the right places. The verdant perimeter of the estate is planted with Ficus hedges, Aleppo and stone pines to maximize privacy and erase thoughts of the outside world. 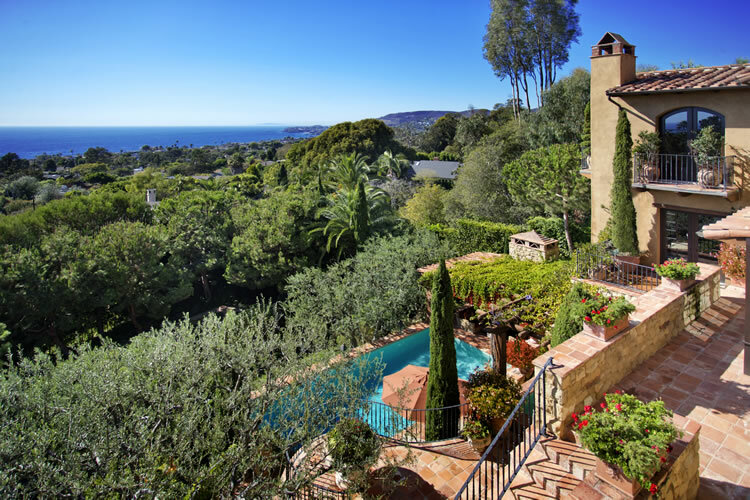 Intimate enclaves rest throughout this magical garden, which is one of the most spectacular in all of Laguna Beach. Villa Allegria…experience the romance of the Italian Riviera in a private, ocean-view oasis.